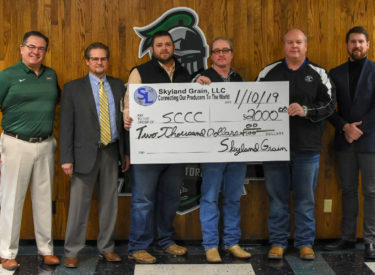 The value of Seward County Community College’s agriculture department was evident when Skyland Grain made a donation to the college. The Johnson, Kansas-based company reached out to award SCCC $2,000 in hopes of creating a pipeline to bring future employees to its company and the agriculture industry in general. While Skyland had a presence among four-year universities, it was lacking with community colleges. SCCC Ag Instructors Nick Noterman and Joshua Morris were grateful about receiving the funds and looked forward to working with Skyland in the future. “Some of the projects we want to develop [are designed to] get more kids involved in agriculture, and Skyland was willing to support that,” Morris added. Murphy also believed that SCCC would be a good fit geographically for Skyland. A partnership between Skyland and SCCC is an important step in keeping the agriculture industry vital, said Dr. Todd Carter, vice president of academic affairs at SCCC.